Garden soil contains minerals, organic matter, air and water. Mineral-based soils alone are not recommended for container plants because in containers, soil becomes very compacted and saturated with water, limiting air space, which is necessary for plant roots. Unpasteurized soil is a source for weeds, insects and disease organisms. Potting mixes intended for plants in containers and pots retain moisture, provide air space for roots, and are free from weed seeds, insects and diseases. Potting mixes, also called soilless mixes or soilless media, usually contain combinations of peat moss, pine bark, coir, perlite and vermiculite. Some composts are also intended for container use. Peat moss is a plant harvested primarily from Canadian peat bogs and some bogs in the northern United States. Peat moss decomposes very slowly, retains moisture in the potting mix while providing a balance of air space and water for healthy growing roots. Peat is acidic (low pH) and limestone is usually added to the mix to neutralize the acidic reaction and balance the pH. Peat moss often makes up 30-80% of potting mixes. Peat moss by itself is difficult to wet, so wetting agents are added to the mix to make it wet easier. 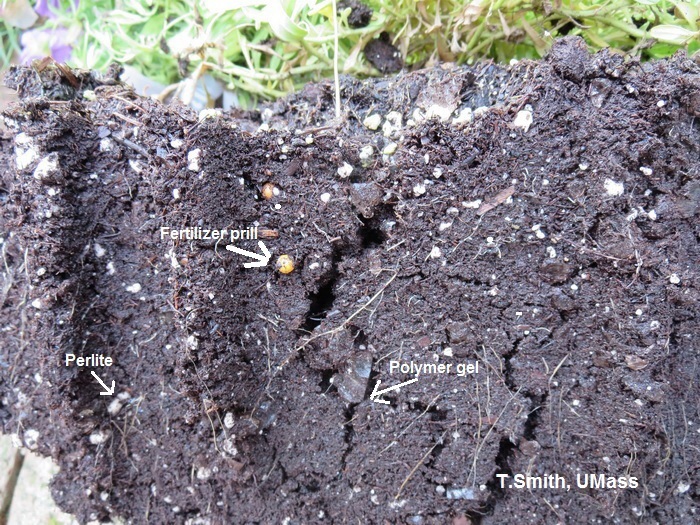 Sphagnum peat moss is the young or live portion of the plant. It is sold as green and living, or brown and dried, and is used for plants requiring moist growing mediums while providing good aeration. It is often dried and milled in seed starting mixes. Bark products are ground and/or partially composted by-products of the timber industry. This is usually a less expensive alternative to peat moss. Bark products have good aeration properties but they dry out quicker than peat moss. There are different properties associated with the specific types of bark. Barks should not be used in starting seedling because they immobilize nitrogen. Composts are sold for in-ground gardens and some for potting mixes. Composts may not be consistent from batch to batch and can be unpredictable in physical and chemical properties. When used in containers, some composts have high levels of nutrients and will burn plant roots and have low air porosity. In gardens, composts are best mixed with existing garden soil. Perlite is small white irregular shaped, volcanic rock that was crushed and heated. The heating causes it to expand. It is non-toxic, sterile and odorless. Perlite is used to improve drainage and aeration. Vermiculite is very light, greyish puffy substance that forms when mica chips are heated. It contains some potassium, magnesium and calcium that will slowly become available. It is used to increase moisture and nutrient retention in mixes since it can also hold onto fertilizer for a period of time - helping to keep nutrients around the roots of your plants instead of washing out the bottom of the pot. Coir is reddish-brown fibers that are harvested from coconut husks, a by-product of coconut fiber industry. It is used in potting mixes for containers in place of peat moss. Coir is easier to re-wet after drying than peat moss. Styrofoam is sometimes used as an inexpensive substitute for perlite. Beads of Styrofoam are used to aerate potting mixes and serve as a space filler. Styrofoam is lightweight, float to the surface when watered and can blow away when pots dry out. Also, unlike perlite, styrofoam will compact over time. A “starter charge” of fertilizer on the label indicates that there is a minimal amount of fertilizer in the potting mix. Most starter charges are gone from the potting soil after watering two to three times. A continuous fertilizer (controlled-release, time-released or slow release) in the bag indicates fertilizer “prills” are incorporated with the mix. Prills are small and round and evenly distributed throughout the mix. The prills are water soluble fertilizer that is encased in a semi-permeable resin coating. When they come in contact with water, small amounts of nutrients are released into the soil for use by the plant over a period of time, usually several weeks. So, each time the soil is watered, the plants are getting "automatically" fertilized. The rate of nutrient release for most of these fertilizers is regulated by temperature. The warmer the temperature the faster nutrients are released. Look for the round fertilizer “prills” in the potting mix. Squeezing the prills can indicate if a fertilizer has been depleted. If the prills are empty, the fertilizer has been released. When the initial fertilizer has been depleted, re-apply controlled-release fertilizer or use water-soluble fertilizer to continue to fertilize plants. Bagged potting mix containing slow release fertilizer must be stored dry. If the potting mix gets wet, the fertilizer in the potting mix can pre-release inside the bag and become concentrated which will burn plant roots when used. Dry, bagged potting mix will be light and fluffy. Wetting agents are chemical substance that increases the spreading and penetrating properties of a liquid (ie. water) by lowering its surface tension. These are used in potting mixes to enable water to thoroughly wet the mix. Tip: Moisten a potting medium with warm water before using to have uniform moisture throughout the container. Plants potted in dry medium and then watered will have inconsistent moisture levels in their root zones. Organic mixes may contain yucca extract as a wetting agent. Some potting mixes contain moisture retaining polymer gels, crystals or chemicals that absorbs water. These help to reduce the need for watering over the growing season. A little extra care will be necessary to avoid overwatering when the temperatures are still cool since the soil will be slow to dry out. The moisture holding ability of the soil breaks down over the season, usually by mid to late summer. When hydrated, water retaining gels look like clear chunks of glass, but are soft to touch. While the all-purpose, general type potting mixes will work fine for almost all annual flowers and mixed containers, there are some crops for which specialty mixes might perform better such as orchids. Orchids require excellent drainage and most general potting soils hold too much water and lack enough air space. Components of mixes for orchids may vary, however, coarse materials are often used to allow for plenty of air movement through the medium. Also succulents and cacti, require better drainage than annual flowers and in many cases prefer clay pots as well. Many succulent collectors use a regular potting mix and mix it with 50% sand, which makes the mix very heavy, but very fast draining. Potting mix bag should be light, fluffy and DRY. Avoid bags that are saturated with water or seem to be heavy and compact. This is especially important for potting mixes that contain fertilizer prills (often labeled as continuous feed, controlled release, timed release or slow release). Look for a potting mix that contains peat moss, pine bark or coir and perlite or vermiculite. Caution should be taken when using a compost-based mix. A soil test is advised. Fertilizer may be in the mix in the form of a "starter charge" or “continuous feed” formulation. Adjust your fertilization practices accordingly. Potting mixes also contain a wetting agent to make the soilless media wet easier. Organic potting mixes may contain yucca extract, a natural wetting agent. Potting mixes may contain moisture retaining amendments such as gels. In landscapes, composts are best mixed with existing garden soil. Manure products are intended for use in-ground gardens but not intended for containers. Manures contain a form of nitrogen that will burn plants in containers. Manure products are best when mixed with soil at a rate of about one part manure to two parts soil. Many manure related products contain sand, which makes them heavy for use in containers. Mulch is usually a raw wood product (bark, wood chunks, shredded wood, etc.). It is intended to be used on the surface of the soil to maintain soil moisture, prevent water from evaporating and suppress weeds. Un-composted wood products, take available nitrogen from the soil as they break down (decompose). Use mulch products on top of the soil in your garden and landscape where they are intended to be. Does the bag feel heavy and compact or light and fluffy? Often, when a bag of garden soil or potting mix is very heavy, it is either water soaked or it contains too much sand. If potting mix becomes soaked it can begin to break down in the bag, become compact, lose air space and result in poor roots and plant growth. Mixes that contain controlled fertilizer prills may pre-release fertilizer into the mix causing young plants to burn. Coarse, horticultural grade sand provides anchorage and air space and is used as inexpensive filler. Unless growing cacti, or used to keep pots from tipping over, sand is not desirable for most plants. Fungi and slime molds occasionally appear on the surface of growing media. These organisms will not hurt the plants or roots. They are saprophytic fungi involved in the decay of organic matter and are more likely to occur when the growing media remains wet for prolonged periods of time. Under normal outdoor growing conditions the fungi are usually short-lived. To eliminate mold, spread the media out on clean surface to dry it and expose it to sunlight, then re-bag or put it into a clean container when it is dry.